"From Humble Beginnings Come Great Things"! 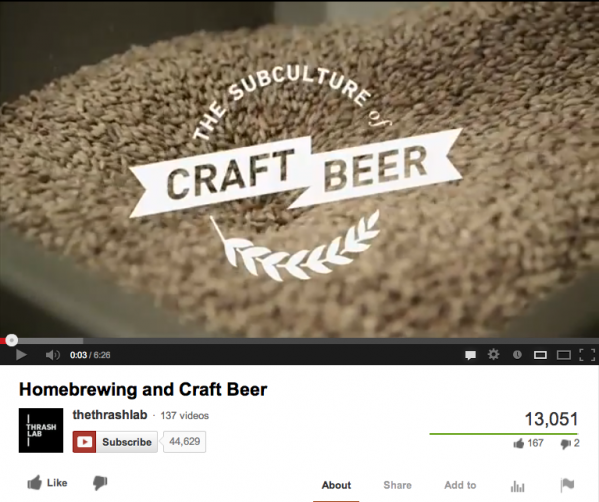 A great YouTube clip out of the US that looks at the culture of home brewing and the link to craft brewing. A large number of Australia's most successful Craft Brewers are testament to this growing phenomenon, where the home brewer finds commercial success in Craft Brewing. Still not convinced that this could be you? 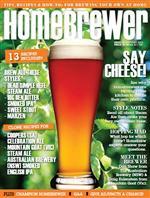 Have a read of this article titled "Home Brew is Where the Heart Is"? If you are just starting your home brewing, or want to take it to another level, you may be interested in one of our Beer Making Workshops. From learning the basics, Ginger Beer and Cider, to Brew In A Bag (BIAB) Workshops are available. We will be listing new dates for Workshops as soon as we get through "vintage". You can check out some photos from a previous Brew in a Bag Workshop (BIAB) on our Facebook Page. 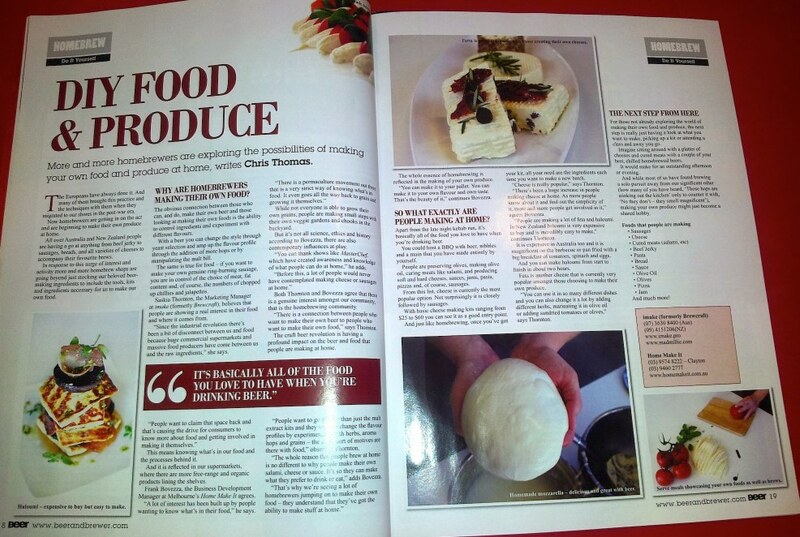 Home Make It were featured in this month's edition of the Beer & Brewer Magazine: Homebrewer, in one of their articles, titled "DIY Food & Produce". Our Manager, Frank Bovezza was interviewed about the increasing interest homebrewers have in making their own food at home. The foods included in this growing trend are the food practices and techniques bought here by the Europeans when they migrated to Australia in the early 40's and 50's. These foods include homemade sausages, salami, cheese, pasta, passata, olive oil, preserves, pizza and olives. The reasons they cite for their interest in making these foods, are the same reasons they give for making their own beer: They can control the ingredients that go in them, and they can control the flavour! Growing interest in making food and produce at home, is not restricted to the home brewing community. There seems to be a real resurgence of interest in making these traditional foods from Europe throughout the wider community. This interest is frequently attributed to popular television shows such as Masterchef or My Kitchen Rules, as credited by Frank in his interview with Beer & Brewer. These programs demonstrate how easy it is to make these foods at home and communities are becoming increasingly aware and concerned about the nasty ingredients or additives that can be included in processed foods. It's a great article and well worth the read. Copies are available at our Reservoir and Clayton stores, or any leading newsagency. Don't forget we also have an online store for your added convenience. We supply all your favourite brands for homebrewing equipment and supplies. These include beer tins, worts, beer enhancers, malts, finishing hops, yeast and everything you need to start brewing your own beer. We are also very excited about our expanding product range and services for grain brewing, which is becoming increasingly popular, as homebrewers take their homebrewing to another level. Shortly to hit our shelves are a wide range of Hop Pellets in 50g and 100g packets, as well as White Lab Yeasts and Wyeats. Within the next two weeks, each store will also have Grain Mill available for on the spot and FREE grain milling for customers. Already available in stores are our wide variety of grains and our Stainless Steel Equipment including Connical Fermenters, Brew Kettles and Hot Liquor Tanks. Come in store and check out our full catalogue for all the sizes available and special features. Our trading hours for March and April have been extended for the "wine season" or "vintage". Our Reservoir and Clayton stores will be open from 9am til 5.00pm Monday to Friday, 9am til 3.00pm on Saturdays, and 10am til 2.00pm on Sundays. We will be open on Easter Saturday, but closed on Good Friday,Easter Sunday and Easter Monday. If your fermentation is still going or you are going through a Malo-lactic Fermentation ensure that you keep your wine warm especially as the weather cools down to avoid any stuck fermentation or incomplete Malo-lactic Fermentation! You can use blankets, doonas, electric blankets, immersion heaters, heaters etc…to keep the temperature between 20oC to 25oC. Our stores offer complimentry wine testing, which includes Sugar, PH or "Mouth Feel". We encourage this at all stages of the wine making process, so please bring in samples for testing. Earlier the better! If you haven't crushed your grapes yet, we also have for hire our Electric Crusher-Destemmer. Call either our Reservoir store on 9460 2777 or Clayton store on 9574 8222 to check for availability. New dates and details for our Food and Beverage Workshops will be released in April. Our Workshops have been put on hold until after the wine season. Our apologies for any inconvenience. For daily updates and news from the HMI team, you can also follow us on Facebook and Twitter. Wishing you a wonderful Easter with your friends and family. Stay safe!